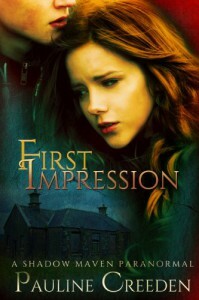 First Impression by Pauline Creeden was a fresh YA Fantasy novel and I thoroughly enjoyed the characters and the story line. I just felt it was a bit too short and I wanted more! First Impression is told from the point of view of Chira, a smart, studious, independent teen attending a private school. I instantly liked Chira – she’s very easy to relate to and like. Her father passed away and her mom has remarried to a man that works at her school, providing the discount she needs to make the school tuition affordable with her scholarship. But Chira doesn’t like him – you get this vague feeling throughout that he’s abusive, at least emotionally, though you never fully see it. I didn’t think it helped/hurt the story any to have him be a sort of antagonist and as a step parent myself I didn’t like that he was unnecessarily cast as a bad guy. Part of me felt like Chira just didn’t like him because she did love her dad so much – but there’s also an element of fear there, so I know it’s more and just wish it had either been fleshed out more fully so that it was really a part of the plot or not an element. Thankfully Chira did have a good relationship with her mother and I found their interactions very enjoyable to read. But because she avoids her step-father and her mother works so hard, Chira is extremely independent and she uses her independence very responsibly. She knows school is important and she works hard. Chira also doesn’t have many friends, because she’s not like the other kids at school. She’s not wealthy and doesn’t have every advantage in life. Her only close friend is Tasha, who does fit in and does have other friends. We don’t get to know Tasha too well – she’s clearly a good friend to Chira and Chira feels very at home with Tasha’s family. There’s a rumor going around school that Chira and Tasha are lesbians and the girls play into it. I don’t know why exactly, but the handling of the rumor bothered me. I guess at some point I wanted it to be acknowledged that the rumor was vicious because it was untrue, not because there’s something wrong with being gay/lesbian. I felt like their was a complicit acceptance that something was wrong with Chira because she was lesbian – I don’t think that was the intent though, it just rubbed me wrong. Early on we also meet Chira’s love interest – Ben. He’s a new student and, like Chira, he doesn’t quite fit in. She quickly learns that there’s something different about him – he’s a Shadow Maven, which means he’s able to see impressions and possessions (ghosts, demon, etc). I thought this was a neat twist – so often when I read books from the first person perspective it is the perspective of the person who is different, talented, etc. So it was neat to read a book where that wasn’t the case. Chira is not special or talented. She just is getting to know someone who is and trying to wrap her head around it. Ben is a nice character – very quiet and keeps to himself. He’s been handed around a bunch because his mother sent him to live with monks as a kid and when he left there he lived with a bunch of different uncles. He’s currently living with one uncle, whose son happens to go to the school too. So First Impression got started very slowly. I expected some fantasy, supernatural whatever to get going and really engross me from the start, like it did in Sanctuary. This was a VERY different book. It’s not until quite a ways in that we encounter the ghost element and when we do, it’s fast and startling and your engrossed and then BAM! it’s over. There were like three or four repeats of that, but the anxiousness didn’t carry through. I was only anxious and scared in the moment – but in that moment, I was FREAKED out. I also have to add that the mystery was very good in that I totally didn’t figure it out. Ben’s ability to work it out was impressive and slightly unbelievable – except that he had his talents to draw upon. That makes it more believable and if I understood the world better, maybe completely believable. The way ghosts and demons are working in First Impressions is very interesting and the Shadow Maven concept is very cool. But they aren’t as central to the story as I would have liked and not very thoroughly explained. I was left with so many questions – and I think that’s just because First Impressions was too short and because Chira is a bit too accepting of Ben. He tells her what he is and she just believes it and accepts this new world view like it’s no big deal. At one point I found myself seriously wondering if this was a world where the general population just accepts that ghosts and demons are real, because no one really seemed to question the appearance of a ghost the way I would expect. The love aspect of this story was sweet – in that it’s a slowly budding romance. I was worried for second that we’d have insta-love because Cira is instantly drawn to Ben, but Pauline avoids that with endearing teenage awkwardness and uncertainty. There was also an almost love triangle, but again, I think Pauline managed to have just enough to give some tension without you ever feeling that there was ever a true relationship potential or hurt feelings. So I really enjoyed Cira and Ben’s growing relationship. I signed up for this tour because I LOVED Pauline Creeden’s Sanctuary and wanted something more from her. Although I didn’t love First Impression as much as Sanctuary it was still a unique YA Fantasy and I look forward to the next installment!